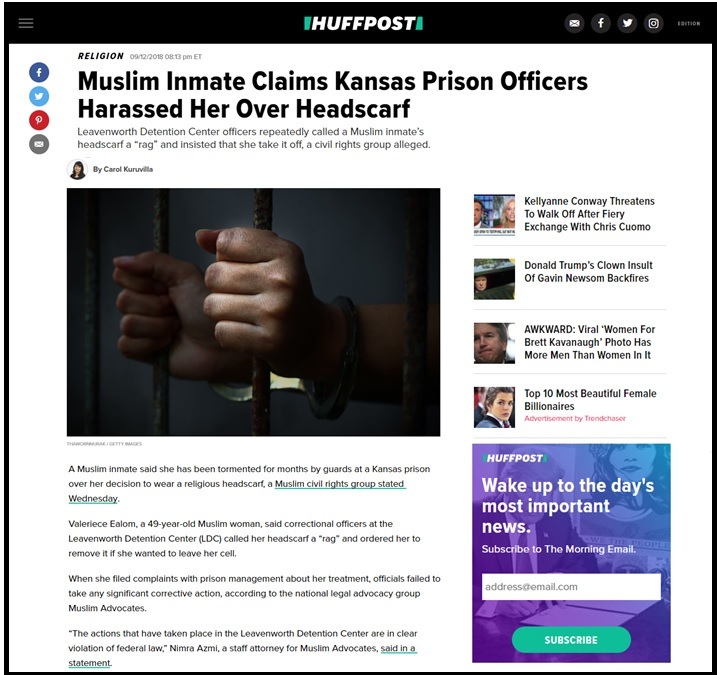 The September 12th headline from the Huffington Post states “Muslim Inmate Claims Kansas Prison Officers Harassed Her Over Headscarf.”1 The national legal advocacy group Muslim Advocates has notified the Leavenworth Detention Center (LDC), the Department of Justice and the US Marshals Service the “actions that have taken place in the Leavenworth Detention Center are in clear violation of federal law,” Nimra Azmi, a staff attorney for Muslim Advocates, said in a statement. The group is alleging religious right violations and failure to meet and ensure compliance to federal detention standards. A strong defense is always needed to show policies, procedures and the actions of individuals did not violate clearly established laws. How confident are you in your current policies and procedures? Where do they come from? Are they based on national standards or contract agreements with a federal agency for inmates you contract to house in your facility? If you are following them are you legally safe? Some administrators (and inmates and advocate groups) assume that the score on their last federal audit or the fact they are nationally accredited is a solid defense card. This simply is not true. While audits and the accreditation process can be useful for discovery, verification and documentation, they are only as good as what is being measured! Generally what is being measured reflects what the outside agency thinks is most important. They also only reflect a snapshot in time and cannot possibly capture everything that may be occurring in the jail on any given day or shift. In short, how do you know if your jail is legally defensible? So, here’s a question to consider in answering that question: When was the last time your jail was audited to what the law requires? Consider that ruling as it relates to possible policies and procedures required by the DOJ PREA standards such as where to house a transgender inmate, dealing with an ICE detainee who has special mail requests, allocated DOC inmate exercise time, or even general staffing requirements. Individual courts – even in the same jurisdiction – may not always interpret constitutional or statutory requirements in exactly the same manner and even when the law is clearly established, individual fact situations may cause differences in the manner in which the law is applied by the courts. The jail design, staffing levels, management practices, and other factors present in individual jail facilities may impact the constitutionality of otherwise sound policies and procedures. Jail officials in each county may differ in terms of how effectively they formulate and how aggressively the enforce the jail policies and procedures (standards should provide for court recognized administrative discretion). As a rebuttal, national standards authors claim they have set a “higher” standard than what is required by law, which in their interpretation provides an elevated defense cushion. However, these higher “liberty interests” as set by various organizations are not necessarily determinative of the requirements of the law.3 Such standards may not adequately address what is actually required by law (various circuit courts and certainly states vary in their laws – one size cannot fit all even to a higher standard) and in some cases, they may far exceed what the law requires. Compliance to those liberty interests and standards are certainly up to the voluntary discretion of any administration, but compliance may come at a significant financial cost, perhaps compromising safety and security, and coupled with policy and procedural changes necessary to meet those voluntary requirements.4 Unless standards are modified specifically to the laws pertaining to your facility, they cannot be inclusive. Many county jails have entered agreements to house inmates in their facilities with federal and state agencies (ICE, US Marshals, state DOC for example). This can be confusing because often these outside organizations refer to standards when they are in fact contract compliance requirements. ICE publicized standards, for example, do NOT apply to American citizens, legal aliens, or even all illegal aliens. They only apply to illegal aliens being housed in facilities under ICE contracts. There is a reason why the contract agreement is being entered. The outside organization gets the bedspace they need from a facility. The contracting jail receives funding for housing the inmates. Unlike standards and while not publicized, every contract agreement is customized for a specific purpose and no two agreements are exactly alike. For housing agreements with jails, each must consider the unique features and resources of the jail (location, design, available programming, resources, bedspace, etc.). A contract agreement may have general stipulations but customization occurs regularly and negotiations are standard and expected. In short, there may be things in a contract that can and should be examined. Contract requirements are not determinative of the law but rather set expectations for services provided by each party. Audits and inspections generally will reflect a verification of their requirements but a pass/fail does not determine the jail is operating according to what the law requires. This leaves a huge gap for any administration wishing to be legally defensible and run a constitutionally safe facility. Policy and Procedure. Many jails have expressed the need and difficulties in updating policies and procedures. Policy is not procedure. Policy explains at a minimum the what, while procedure explains the how. Even template model policy requires officials to create procedure and customize both according to their specific jail and administrative needs. The LBJG address both components for policy AND procedure, providing framework to what the law requires. Proactive Litigation Defense. Legal-Based Jail Guidelines aid jail officials to understand and comply with constitutional and statutory requirements for inmates. Knowing the law isn’t easy and most agencies can’t spend 10 hours a week researching the latest and greatest cases in the law library. Consider how much training time staff receive on correctional law or legal issues annually and the responsibility to run a constitutionally safe jail. Answering Inmate Grievances. Inmates submit grievances daily for very specific reasons.7 As policies are usually written generically, answering inmate grievances to specific issues can be challenging. The LBJG provide the what (guideline description), why (Rationale statement) and how (Compliance) along with over 1000 annotations to case laws and other references giving those who respond to grievances common sense, case-law answers at their fingertips. The online keyword search tool makes searching specific topics found in grievances simple and quick. For this reason and because there is no limit to the number of users, many participating agencies give all of their staff user access rights to the LBJG. Training. Given the variety of topics and subjects, it would be impossible and costly to address them all in training. 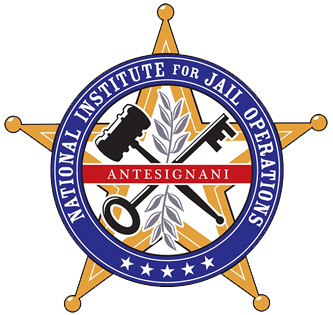 Many jail administrations are using the LBJG to serve as a daily training topic for each shift. When the line staff is questioned why they did or didn’t do something while on the defense stand, rather than saying “we did it because admin and policy says so” they can confidently respond knowing what the law requires and more importantly why.8 And because the LBJG are online, the training can be accessed at any time on any shift. For those that want to find out more about the Legal-Based Jail Guidelines for your facility, contact NIJO. If your agency is already using the LBJG, please note the mere existence of the LBJG provides no magical protection against civil rights violations. They are of limited value with defending inmate litigation, crafting legal-based policy, procedure or training if they are not utilized aggressively. 2. Bell v. Wolfish, 441 U.S. 520, 543 n.27 (1979) (emphasis added); see also Rhodes v. Chapman, 452 U.S. 337, 350 n.13 (1981); Gregg v. Georgia, 428 U.S. 153, 173 (1976) (joint opinion). 3. Rhodes v. Chapman, 452 U.S. 337, 350 n.13 (1981) (emphasis added). 6. Turner v. Safley, 482 U.S. 78, 89-92 (1987). The training materials provided are for use only within the scope of your jail and may not to be distributed otherwise without written permission by NIJO. The information contained herein is to be used solely for training purposes and shall not be construed as legal advice. Users of these materials should consult legal counsel to determine how the laws of their individual jurisdiction affect the application of these materials and guidelines to their individual circumstances.